Commuter speed lanes on Oxford St? Jump to media player The BBC's Brian Milligan tries out pedestrian speed lanes on London's Oxford Street, consisting of a slow lane for shoppers and a fast lane for commuters. In the slow lane on Oxford Street Jump to media player London's Oxford Street is one of the busiest shopping streets in the world. But will separate walking lanes solve the problem of pedestrian congestion? 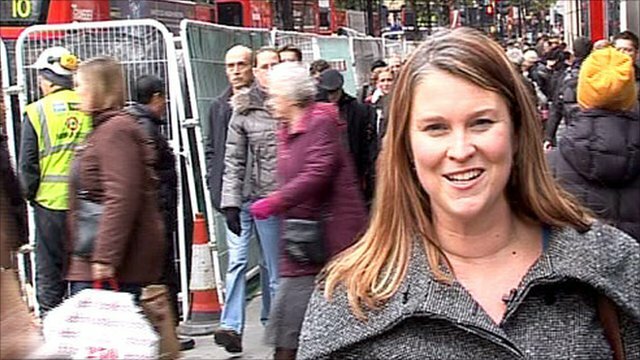 Pedestrian speed lanes for London's Oxford Street? Business owners have come up with an idea to combat congestion on one of the busiest shopping streets in the world. 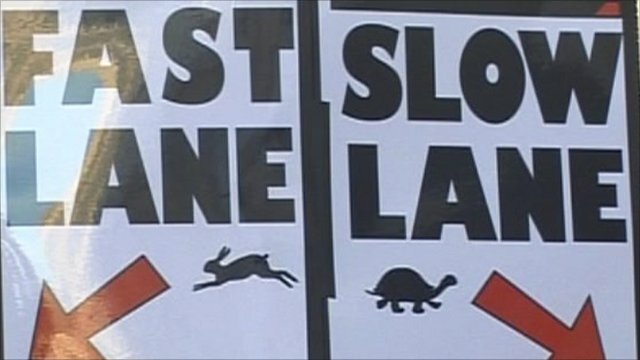 They say speed lanes on London's Oxford Street, consisting of a slow lane for shoppers and a fast lane for commuters, could be a solution. The BBC's Brian Milligan tries out the idea.